GetDivorcePapers.com provides professionally completed, 100% court-approval, money-back guaranteed Ohio divorce forms. Just create an account, complete the interview, and file for divorce. Our case managers do all the work for you, and send the completed Ohio divorce forms when they are ready to be filed. 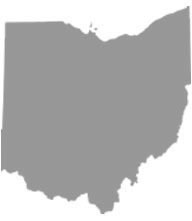 When filing for divorce in Ohio, one partner must have been a resident for at least six months in the state and three months in the respective county. If either partner is a military officer stationed in Ohio, then restriction for being resident is removed. Separation, voluntarily for up to one year. Marital disharmony with no reconciliation chances. Desertion, knowingly for one year or more or neglect. Preference and choice of the child. Age and health conditions of the child, as well as the parents. Child's adjustment and attachment to parents, school, siblings, community and home. Where the parents currently live, or plan to live. Can the parents cooperate when it comes to making decisions for the child and has either parent ever not let the other have visitation hours. Any history of domestic abuse or of kidnapping by parent. How close the parents live to each other. Available time of the child and parents. As Ohio is a state of equitable distribution, each partner gets to retain their property that they've obtained before marriage as individuals. It also includes anything that is given to them as gifts or as an inheritance. Sources of income, needs and any liabilities of each spouse. Contribution towards getting the property, both financial and as a homemaker. Whether letting the spouse with custody live in and own the family home. Economic attraction of owning the property and any tax to be paid on it. Liquidity of property under consideration. Duration of the couple's married life. Is the person asking for support the legal guardian of the children? What is the income sources, amount and earning ability of both spouses? What is the age and the health conditions of both spouses, and how long did the marriage last? What is the level of education of both spouses and their vocational and professional skills and what was the contribution of the other partner in building them? What are the assets and liabilities of each spouse? One or both parents can be ordered to pay child support. The child support will be paid through a child support agency. If the child has special needs. If there are other minor or handicapped children. If there are other payments ordered by the court. How much each parent earns, how much tax they pay and what are their liabilities and needs. Extraordinary transport or visitation costs, if parents live far apart geographically. Responsibilities of the parents towards other people. Value of services not in money by each parent, as well as other major contributions including clothing and lessons. Physical, emotional and other needs of the child. Child's medical or educational needs. Standards of livings that the child is foregoing because of the divorce. In cases concerning children, or if requested by one of the parties or if the court thinks it is necessary, mediation may be ordered. The court can assign and decide the process as well as the mediator. There is no need of a lawyer when applying for divorce in the state of Ohio. A divorce case which is filed without any help of an attorney in any of the states is known as Pro Se Divorce. Literally, Pro Se is a Latin phrase and it means "on her or his own". Process of getting the divorce without the help of lawyer may vary from one State to another. These types of divorces are perfectly legal and enforceable in Ohio, and are actually very convenient. Usually, once settlements have been made regarding property distribution and custody matters among the spouses in case of a mutual divorce, Pro Se Divorces are filed.